Posted April 14, 2019 by Bob Lessard. Three crews converge on the last unfinished piece and make quick work of it. 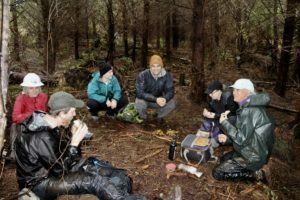 Our NCTA partners put on a high energy event, and NWTA signed up 40 people to Storm the Coast and build some trail on the burgeoning new Klootchy Creek trail system in Clatsop county near Seaside/Cannon Beach. A total of 65 people turned up. People came from Portland, Vancouver, Camas, Troutdale, Longview, Castle Rock, Tigard, Gresham, and Beaverton. 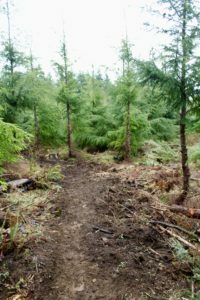 They drove up to 80 miles to show their enthusiasm for the project put together by NCTA and Greenwood Resources, to build a 45 mile system of trails connecting Klootchy county park to Seaside – a coastal trail system with ocean views. Keep your eye on this project !!!! The goal for the day was to “rough in” a section of trail, but the crew could not help themselves. A bit over a mile of finished trail got built. The main focal area had the bulk of the volunteers working the soil, but a few others were working a machine built section as well. 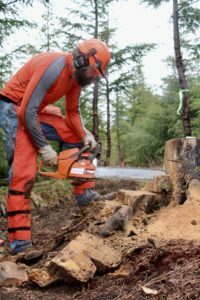 It rained steadily all day, but you could hear the chainsaws and hand tools going for hours, and the crews kept leap frogging their way down the trail until all were exhausted. All in all, an outrageously successful day. 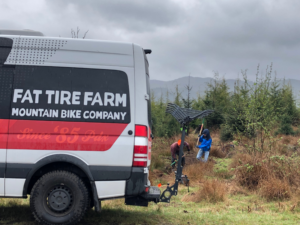 Kudos to Colin for pulling the NWTA tool trailer all the way out to the coast, to Fat Tire Farm for always supporting our community, to Owen and Chris R for organizing everything on the NWTA side, and to Steven and Chris Q and the rest of NCTA for being such good hosts. Big thanks to Greenwood Resources for having faith in mountain bikers, to the Washington Coast Visitors Association and Clatsop County for seeing a future for mountain biking in the area. And cheers to the volunteers who braved the weather! Fat Tire Farm’s shuttle van. People were too tired to use it after all the hard work.